The purpose of this presentation is to press The BC Green Party to deal with the issue of Independent Power Producers in a manner satisfactory to environmentalists. My sole concern is that BC has a viable Green Party option for next May’s election. I have never met Dr. Weaver. Independent Power Producers (IPP´s), created by Gordon Campbell in 2002, were to produce power with unobtrusive little power schemes (daintily referred to as “run of river”). In fact, they were, from the outset, environmental catastrophes and by reason of sweetheart deals with political pals, have, just as predicted, have all but bankrupted BC Hydro. 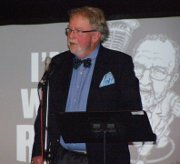 Dr. David Suzuki, an eminent environmentalist, has recently classified Hydro power as not “clean and green” as alleged by Dr. Andrew Weaver, now Leader of the BC Green Party, when he endorsed Campbell’s 1992 Energy Policy scheme and supported this Liberal policy during the 2009 and 2013 elections. My every instinct wants to support the Green Party but its endorsement of this policy makes it clearly impossible for any environmentalist to do so. Clearly Dr. Weaver did not do this. Dr Weaver’s letter to me, in full, follows this. Are you under the mistaken notion that your doctorate conferred the status of deity on you? Your patronizing crack about “water wheels” was quite uncalled for, unbecoming and ironic since it was clearly you and the other suckers, who believed Campbell’s propaganda, who were taken in. Let’s look at the record. You approved the Campbell Energy Policy of 2002 and, if you looked, could see with your own eyes what the consequences would be. I sought advice from economists, environmentalists, and scientists and toured the Ashlu River first in 2007, shortly after becoming Official Spokesman for the Save Our Rivers Society, a paid position. Dr. Weaver, If you tell me that you approved of this “rivers policy” after actually seeing the Ashlu River then you should be committed. Have you seen it yet? Or any of the rivers destroyed by this policy that you, Leader of the Green Party, so enthusiastically endorse? Unlike you, I have five years of government experience. In Cabinet, I watched and took my part in running BC Hydro, and quickly learned that it consistently and deliberately overestimates its needs and always has. Moreover, it has a mindset against alternate energy sources only seeing hydro thus, like the carpenter whose only tool is a hammer, everything looks like a nail. It was clear to our government in 1980 that there would be no need for additional power for about 25 years, confirmed by the then independent BC Utilities Commission, a figure that has consistently been pushed forward and today is about 20 years. Yet Hydro policy, supported by you and the Green Party, destroys our rivers, their ecologies, is bankrupting our public power company, while further enriching Liberal pals TO MAKE POWER BC HAS NEVER NEEDED AND WON’T LIKELY EVER NEED! As a matter of interest Dr. Weaver, have you any idea of how much these IPP´s donate to the BC Liberal Party each year? You now complain that the government didn’t enforce the environmental rules, yet I and my associates complained bitterly about that from the beginning – where were you? Show us a Hansard and all the outraged objections you raised, not during the Jessop Show last December 17*, but at the time. Now you have the cheek to use pictures of environmental disgraces you did nothing to stop to prove YOU were right! That tells me either you went to the Ashlu before you began ear-lobe nibbling with Campbell and decided it was in your political interest to keep your mouth shut OR you didn’t want to know the truth and couldn’t be bothered to go all the way to the Ashlu from Victoria to see for yourself. Instead you waited until last December to complain to Ian Jessop in a general interview! Any reasonable person would conclude that you knew or ought to have known what Campbell’s river policy was going to do environmentally, long before you signed on to it. Moreover, if I knew and could tell people, by 2008, what the sweetheart deal between Hydro and the IPP would do to Hydro finances, you must have known. Any half-decent opposition leader would have known these things. Give it a try some time, no one else is these days and you never know what you’ll learn – as by visiting the Ashlu River when I did. It is my understanding that when you’re criticized you sue, something I always found inappropriate. (I couldn’t stop being sued of course!) I felt that as Harry S Truman said, “if you can’t stand the heat, stay out of the kitchen”. I am sorry Rafe but it appears to me you don’t understand the difference between small scale hydro and large scale hydro. 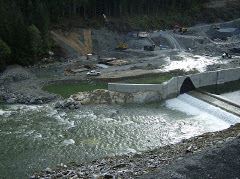 A water wheel is small scale hydro; Site C dam is large scale hydro. David’s article is referring to large scale hydro. He and I agree on the folly of Site C.
With respect to small scale hydro, you don’t know what my views are as we have never spoken about it and your only reference is one snippet from a long interview on a now departed Radio hosts show. You misrepresented my views in that. I would have expected better from someone like you. I quite clearly stated that small scale hydro can provide some of the most environmentally friendly means of generating electricity if it is done in a properly regulatory environment. The problem with the BC Liberal approach to small scale hydro is the same as the problem with their approach to mining and forestry as well. They believe fundamentally in the professional reliance model and that government should stay out of the way and only apply tokenism in the area of compliance and enforcement. I, and the BC Greens believe that the role of government is to protect public resources. It is our duty to provide the regulatory environment and compliance/enforcement capacity to ensure that strict standards are maintained. Your approach seems to be to throw the baby out with the bathwater. Our approach is to be far more cautious. We have a grand challenge ahead of us – the rapid decarbonization of our energy systems if we as a society want to make it out of the 21st century. That means no new investment in major fossil fuel infrastructure and widespread introduction of clean energy generation, storage and transportation systems. But in my view it’s critical that government provide a strong regulatory environment for the introduction of the latter. The BC Green party have a shared vision of a prosperous province ground in a 21st century economy that is fiscally, environmentally and socially sustainable. It is a vision that puts the interests of people ahead of the interests of big corporations and big unions. Rafe, while looking at BC Hydro documents regarding IPPs, I learned they’ve already contracted for private power that is 145% of the level of purchases in FY 2015. Since we know that demand has been essentially flat for a decade and they’re rushing SiteC toward completion, where are they planning to sell it? The most recent MidC wholesale rate is between 1/3 and 1/2 of the IPP prices so BC Hydro has no export market. It is going to be dumping power outside the province but it will also be dumping almost $1 billion into IPP pockets in a year. For Andrew Weaver to continue supporting BC’s private power fiasco, there must be a reason not immediately obvious. I suspect it has something to do with how the BC Green Party is being financed. It sounds to me like you never visited these large scale “IPPs” back when you were stumping for them and the Campbell Energy Plan in 2008/09. If you had, you wouldn’t have said such things then or now. I did in fact visit these projects, more so than anyone in BC, with my colleagues like Joe Foy, Gwen Barlee, Tom Rankin, West Kootenay Eco-society and others. I took my camera and made a series of films about them, called Powerplay and Rivers at Risk and shared these images with the people of BC, when no media outlet or politician would. The Ashlu River, Harrison Lake, Toba Inlet, Pemberton, and many more. This was no mean feat. In many cases, my colleagues and I faced aggressive pushback from private companies, who did everything they could to bar us from documenting their work on public land and waters. They blocked roads with heavy equipment, tried to intimidate us with threats, slandered and libelled us – anything to keep us from bearing witness to the true scale of these projects in our public wilderness. I also ventured to the site of many proposed projects in the Kootnenays, Northwest BC, Clayoquot Sound, and up Bute Inlet, flying over the Homathko, Southgate and Orford valleys to document the $5 Billion, General Electric-backed proposal to dam and divert no less than 17 rivers. This would have meant several hundred kilometres of industrial roads and 100-meter-wide transmission lines through coastal wilderness. Our colleagues at Watershed Watch used then-cutting-edge Google Earth software to superimpose these roads, transmission lines, pipes, and plants over satellite imagery of the landscape to illustrate the sheer magnitude of this project. Rafe and I and many others spoke out at overflowing public meetings and, thankfully, were able to head this one off before it destroyed our longest coastal fjord. We stopped most of the big ones – Bute, Upper Pitt, Glacier-Howser, Ryan, etc. – with monumental effort, but, sadly, many others got through. Very few, if any, match your description of innocuous water wheels or “small scale hydro”. And that’s just the environmental hypocrisy of the story – saying nothing of the massive financial fraud perpetrated on taxpayers and hydro ratepayers. We don’t have the money to pay teachers, buy textbooks, build proper public transit, get our hospital wait times down, or address the most shameful record of child poverty in this country, and we wonder why. I can draw a straight line to BC’s disastrous energy policy. On that latter point, one can chalk it up to a lack of fiscal acumen on your part – but the environmental side is supposed to be your bailiwick. BC’s “IPPs” do not, nor have they ever remotely resembled the water wheels you describe. You are talking here to people who well know such things. Well said Mr. Gillis, sir. Rafe, I am thisclose to fully believing neither Mr. Horgan nor Mr. Weaver want the top job. They are in their comfort zone. That is quite an arrogant and condescending letter from Mr. Weaver. Wow. He won’t grow his support with that kind of attitude towards people who wish to debate him.